By Chris Williams: Former eight division world champion Manny Pacquiao (60-7-2, 39 KOs) scored his first knockout in nine years since 2009 in stopping a completely shot looking WBA ‘regular’ welterweight champion Lucas Matthysse (39-5, 36 KOs) in the 7th round on Saturday night to win the World Boxing Association secondary 147 lb. title at the Axiata Arena in Kuala Lumpur, Malaysia. The fight was stopped after Pacquiao knocked the 35-year-old Matthysse down with a left uppercut in round 7. Referee Kenny Bayless stopped the fight. It was a quick stoppage by Bayless, but Matthysse spitting out his mouthpiece made it clear that he was quitting. All total, the 39-year-old Pacquiao knocked Matthysse down three times in the fight in dropping him in the 3rd, 5th and 7th. In round 3, Pacquiao knocked Matthysse down with an uppercut in a one-sided round. Matthysse was down again in the 5th round from a right hand to the temple. It was a grazing shot, but Matthysse still went down with a delayed reaction. In the 6th Pacquiao hit Matthysse with hard uppercuts, jabs and mostly left hands. It was no longer a fight at that point, as Matthysse looked defeated. With the victory, Pacquiao’s former promoter Bob Arum of Top Rank will make a huge push to put him in with Vasyl Lomachenko next in December. Pacquiao will probably need to move down in weight to at least 138 for the fight to happen. Arum will of course make an effort to match Pacquiao against Top Rank stable fighter Terence Crawford, who holds the WBO welterweight title. If Pacquiao turns that down, Arum will then likely offer Lomachenko for him to fight. If Pacquiao still says no, Arum will almost surely offer him WBC light welterweight champion Jose Ramirez. Pacquiao would get more attention if he was to fight Keith Thurman or Spence, but he would lose to them badly. Crawford would beat Pacquiao, but there wouldn’t be much interest from the casual boxing fans in a Pacquiao-Crawford fight. Pacquiao looked a lot faster and more powerful tonight than he had in a long time. 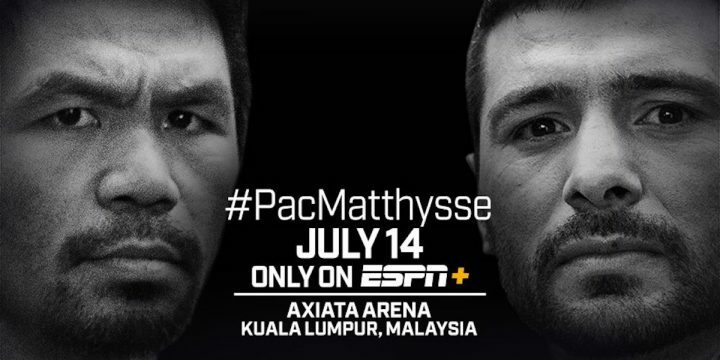 Of course, Pacquiao was fighting a smaller fighter than he’s been accustomed to in 5’6” Matthysse, who has most of his career at 140 rather than 147. Matthysse clearly doesn’t belong at 147. He was always going to be too small to compete against the top welterweights. The only reason Matthysse won the vacant World Boxing Association welterweight title last year is because he was facing a weak opponent in Tewa Kiram. Pacquiao didn’t have to worry about the size of a top welterweight tonight. If this had been Errol Spence Jr. that Pacquiao was facing, he probably would have been smashed within six rounds. Matthysse looked absolutely shot tonight in getting dropped three times and knocked out. It wasn’t that Pacquiao has improved. It’s more of a case of Matthysse being so utterly over-the-hill. Pacquiao was smart to pick a shot fighter to go after for a world title at welterweight, because if he had faced Spence, Danny Garcia, Shawn Porter, Keith Thurman or Terence Crawford, it would have been career over for the Filipino star. Matthysse needs to retire because he’s completely shot at this point in his career. The 35-year-old Matthysse has had too many wars during his career and it’s really taken a lot out of him.